As we told you in our last post, we came to Utila, Honduras to get my Open Water certification in scuba diving. That, and a few fun dives for the both of us. That was supposed to be it. The second I descended in open water that all changed… I was instantly drawn in by the new world that exists under the surface of the ocean. Each dive found me more and more comfortable moving and breathing underwater and I discovered more and more cool things to see. Before Mike had even dipped his toe in the water (okay, he had actually done some snorkelling at this point), I had him almost convinced that we should stay and do our Advanced Open Water certifications so we could dive deeper, try a night dive, and check out a wreck. He whole-heartedly agreed with this plan after only his first fun dive… it seems we were both equally enamoured with the underwater world and weren’t ready to leave it behind as we travelled inland. We pushed our cheapskate tendencies aside and forked out another $250 a person for our Advanced course. We had such a great time with Captain Morgan’s Dive Centre and our instructor Talon (from 1dad1kid.com) that we decided to stick with them for the second course. The course fee included 5 course dives, 2 free fun dives, and 3 nights accommodation. Of the five course dives (termed adventure dives) we were required to do a deep dive (to 30 m) and a navigation dive. After that we had our choice of the next three from about a dozen options. We chose to do a wreck dive, a night dive, and a peak performance buoyancy dive. The deep dive blew our mind as we looked at the colour and pressure changes to a Coke bottle at 30 m (100 ft). The wreck dive was spectacular… the wreck is found between 18 and 30 m. Even with exceptionally clear water, you can’t quite see it from the surface. It’s just too deep. As you descend, it slowly starts to materialize beneath you… really cool. 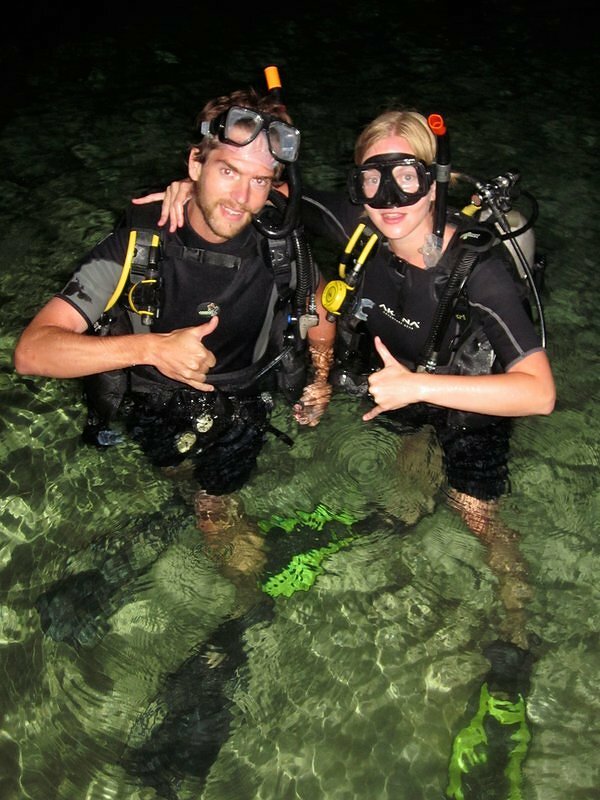 The night dive allowed us to experience yet another new world underwater, as everything we were used to seeing changed. You get to see totally different critters out and about from what you see during the day, and the water has something called bio-luminescence which lights up and glows like hundreds of green stars as you swim through it. … which was important to us because we were toying with the crazy idea of sticking around Utila to take our rescue diver and divemaster courses. Ultimately, after a week of heavy decision making, we decided to become divemasters (more on this later). Which is why, almost seven weeks later, we are still in Utila. And still loving diving and loving life. Some of our favourite underwater sightings have included: Hawksbill turtles (my favourite! ), common octopus, eagle rays, southern stingrays, roughtail stingrays, yellow stingray, longsnout seahorses, moon jellyfish, free swimming green moray eels, scrawled filefish, lionfish, leopard flatworm, reef squid, juvenile spotted drums, parrotfish (Mike’s favourite! ), and yellowtail damselfish. This is why I love teaching scuba! I think it’s fair to say the ratio of your students with this response to your teaching is much higher than when I taught math! LOL Hard to compare math with scuba. Wow! This sounds so amazing. To tell you the truth, I’m a little scared of scuba diving, but after reading this you have me convinced that I should do the course and a diving trip. We are hoping to sneak in a trip to the Maldives(its very close to Sri Lanka) if we can save up enough money. I couldn’t believe how fast I got hooked on diving. Once you realize that you can breathe just fine underwater, you can really experience the beautiful world under there. One of our instructors here used to work as a videographer/instructor in the Maldives. His footage of the aquatic life there is phenomenal… there are so many fish! It sounds quite expensive though. If you can fit it into your schedule and budget, let us know how it goes. Thanks Delaine! We wish you and your family a Merry Christmas too! We love snorkelling too and diving just took it to the next level. Once you can move around freely under the water, there’s a whole new dimension to explore. They fill empty plastic bottle with pieces of white bread and water for fish food here. And on our deep dive, we got to crack open eggs at 30 m to play with the egg yolks under pressure. You can actually play catch with them! Mike was pretty disappointed when a snapper came up and ate his before he got a chance to play with it though. Ok …stupid question. What about sharks? Did you see any and were you nervous about getting bit? I have never done it but it sounds amazing! You could email me directly if you prefer? We did see sharks. Mostly nurse sharks, though you can also dive with reef sharks at the nearby island of Roatan. We were never really were worried about getting bit though. It turns out that as long as you are not fishing/feeding/baiting sharks, the odds of getting bit while diving are exceptionally low. Just like the signs at the zoo and national parks say… Don’t feed wild animals.